Candied Sweet Potato Latkes. A fun twist on the classic, made with maple syrup, vanilla, a bit of OJ and some coconut sugar. Gluten free and nut free! Do you remember the year (2013) when Hanukkuah and Thanksgiving overlapped and we did this thing called #Thanksgivukkah? That was totally crazy and hectic as anything BUT one ood thing to come out of it was this crazy good mashup recipe for Candied Sweet Potato Latkes. These are perfect for Hanukkah or for Thanksgiving or for Friday night. Because, let’s be real – CANDIED SWEET POTATOES are a good thing. And, in this case, a great thing. Because these bad boys are gluten free, nut free, vegetarian and I include a dairy free option in the notes section. Did I mention refined sugar free? Oh yeah. I can’t wait to hear what you serve them with!! If you have a food processor (if not, use a handheld box grater), fit with shredding blade. Shred peeled sweet potatoes. Change blade to chopping blade and pulse until onion is finely chopped but NOT watery (of use a knife to finely chop). In a large mixing bowl, combine shredded potatoes, chopped onion, beaten egg plus egg white, orange juice, vanilla, palm sugar, maple syrup, tapioca flour, salt, cinnamon and nutmeg. Mix until well combined. Let mixture sit for 10 minutes to release liquid. Use your hands to squeeze out all the excess liquid and pour out or drain through a fine mesh strainer. You may need to do this 2 or 3 times to get all the liquid out. This is very important for cooking as the excess liquid will make the latkes fall apart. Heat a large frying pan (I used a 12" non-stick) over medium heat. Once hot, add 1/2 Tablespoon of butter plus 1/2 Tablespoon coconut oil to pan. Use your hands to form the latkes making sure to press them together (about a rounded Tablespoon each) and gently place in frying pan, five latkes at a time. Cook, undisturbed for 8 minutes and gently flip. Continue cooking on other side for 5 more minutes until brown and remove to a parchment paper lined baking sheet. Repeat until all latkes are cooked. Serve immediately or refrigerate until ready to reheat. To reheat, preheat oven to 325F. Place tray in oven until latkes are warmed through, about 15 to 20 minutes. Serve with a touch of maple syrup and Enjoy! To make dairy-free, omit the butter and substitute coconut oil. If you want to make these for the freezer, cook them as directed, allow to cool completely and freeze in a single layer. Once frozen, transfer to a ziploc or other airtight container. These were a big hit for our second night of Hanukkah.And they will be back (by popular demand) before the holiday’s over. Thank you for another great recipe and happy holidays! I made these three times last week. The first time was a test batch. The second time I tweaked a few things: I used 2 whole eggs, I shredded 2/3 of the sweet potato and grated 1/3. Before mixing the potatoes with the other ingredients I put the shredded and grated potato in a kitchen towel and squeezed out all the liquid I could. These little changes gave the latkes the texture I was looking for and they held together better. The combination of orange zest,onion, cinnamon and nutmeg was fabulous. My husband was in Chanukah heaven. Thanks for sharing this recipe, which is now my favorite latke recipe. What a great dish!! They would have tasted wonderful with sweet potato. I love the idea of Thanksgivukkah and such a rare occurrence. The latkes sound delicious! I think I’ll make them this ween-end instead of the regular pancakes. What a great fusion of holiday flavors – I can taste it already! Ooo, those sounds tasty! I’m all about sweet potatoes lately. So glad you and your family are able to celebrate this once in a lifetime holidays combination, that is so cool. Sweet potato latke sounds fantastic, very clever. I sometimes make something similar to this. Such a great dish – I’ll eat sweet potatoes any way I can get them! This is wonderful – thanks. I make sweet potato latkes every year but I love all the Thanksgiving related elements you added to this (I was wondering if there might be marshmallow but to be honest your version sounds amazing and glad there aren’t)! Great to meet you through this virtual potluck. I love the maple syrup addition! Perfect for Thanksgivukkah, Alyssa! What a delicious celebration this will be. I love all these great ideas in the blogger potluck, too – definitely a once in a lifetime dinner! I know – I *almost* have our menu finalized. What are you making? This is a brilliant mash up of Thanksgiving and Hanukkah, and I bet it just tastes amazing. Great recipe and a once-in-a-lifetime bloghop! I wonder who spotted this curious coincidence? The latkes could also be a fun breakfast (especially if cooked from frozen – no fuss). Super flavour-packed idea. Great links to click too. 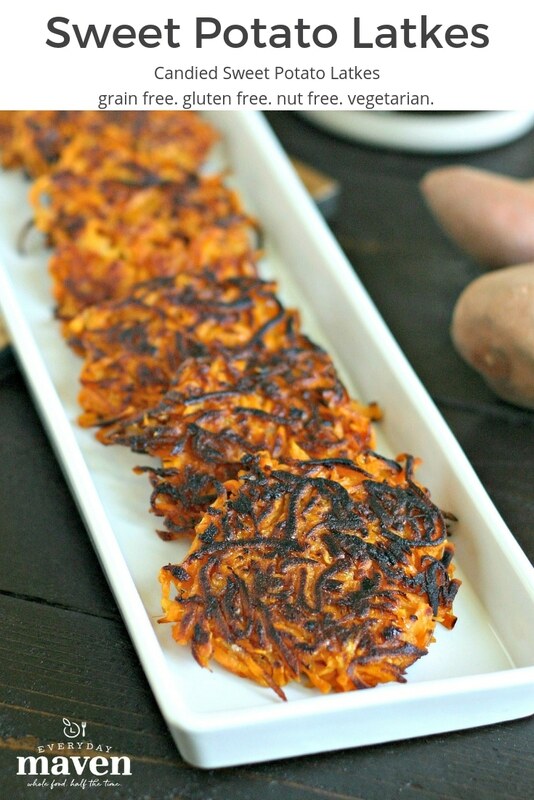 I love sweet potato latkes but haven’t tried them sweetened before. These sound fantastic. Happy Thanksgivukkah! Happy Thanksgivukkah to you as well Colleen! These look fantastic! I love that they’re not super sweet, just the bit of maple to bring out the sweetness in the potatoes. I hadn’t thought to use tapioca starch in latkes but I do use it in many other ways. Definitely gotta try this one! They are not too sweet – just the perfect amount and the sweet onions caramelize a bit during cooking so there is a great balance of sweet and savory! Wow! These are so yummy! And how cool you get to celebrate both holidays on the same day. I know – my son is beyond excited! Latkes in any way shape or form are good with me! Me too – although I still think the classic potato are my all-time favorite! I just had a complete “duh” moment. All these years making latkes and it never occurred to me to make them with sweet potatoes. LOVE. Life changing! Loving this sweet and savory take on latkes!